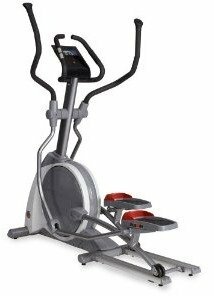 The Ironman 1860 elliptical trainer is an advanced design over the 1850 sister model. It includes touch sensitive console buttons and heart rate control programming. The blue and yellow backlit LCD display shows readouts for time, distance, speed, calories, and pulse rate. It has red backlit control buttons and 17 workouts to choose from. There is one heart rate control program, and a wireless chest strap is available to transmit your heart rate during the exercise to the console computer, which then automatically adjusts the resistance based on the control program. The Ironman 1860 elliptical trainer offers a smooth, low-impact workout thanks to its industrial strength belt-drive system and dual aluminum wheel track system. Other features include a low pedal step-up height, moving handlebars for an upper body workout, a touch sensitive display, a 19" stride length, textured footpads, and a convenient AC plug-in adapter to light the console and power the friction-free automatic resistance braking system. Many of the reviews done on the Ironman 1860 model have praise for its design, but also point out that it doesn’t offer anything exceptional that you won’t find on any other elliptical trainer at this price range of $1,399. It gets good marks for its ergonomic fit, stylish design, easy to use console, small footprint, and quiet operation. It is one of the more challenging machines to assemble but that is a minor point. 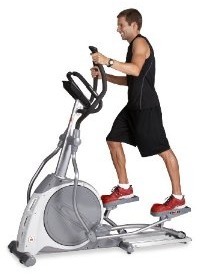 The Ironman 1860 elliptical trainer is a dandy of a model – just very (very) overpriced. If it were priced around $999, it might even make some Best Buy lists, but at $1,399, it is not worth a second look. Now that Star Trac has taken over the bankrupt Ironman brand, there is some hope for the company. But this is still an overpriced model. The better option is the less expensive 1850 Ironman which has the exact same frame and components, but a different console and no wireless telemetry.